Some of Mars' moons are shown in this sky map, March 2012. The Full Moon of March is usually called the Lenten Moon. In Algonquian it is called Worm Moon. Other names are Crow Moon, Crust Moon, Sugar Moon, Sap Moon, Chaste Moon, and Death Moon. In Hindi it is known as Basanta Purnima or Dol Purnima. Its Sinhala (Buddhist) name is Medin Poya. The Full Moon rises around sunset and sets around sunrise, the only night in the month when the Moon is in the sky all night long. The rest of the month, the Moon spends at least some time in the daytime sky. The First Quarter Moon rises around noon and sets around 3 a.m.
Mars will be directly opposite the Sun in the sky. It rises at sunset and sets at sunrise, visible the whole night. Because of Mars’ elliptical orbit, it will not actually be closest to Earth until nearly two days later. Mars will be 0.674 astronomical units (100,780,754 kilometers) from Earth. This is a very unfavorable apparition of Mars, Mars being about as far from Earth as is possible, close to aphelion. The dim glow of the zodiacal light, caused by sunlight illuminating interplanetary dust, can be seen in the western sky after the end of evening twilight. Mercury will be at its best in the evening sky for the year 2012 for observers in the northern hemisphere. Jupiter and Venus ride high above it. Mercury will be at its best in the evening sky for the year 2012 for observers in the northern hemisphere on March 6, 2012. The two brightest planets will be only 3 degrees apart this evening. The two brightest planets will be only 3 degrees apart March 13, 2012. In eastern North America, observers will see two of Jupiter’s moons cross Jupiter’s disk. Further west, observers will see the two moons’ shadows repeat the transit. Two of Jupiter’s moons cross Jupiter’s disk in March 2012. Venus is always visible in daylight if you know exactly where to look. Today the waxing crescent Moon will be your guide: Venus will be visible just above the Moon. Venus is just a few hours shy of being at its greatest elongation from the Sun in our sky. Venus will be visible just above the Moon during daylight hours on March 26, 2012.. Observers in western North America will see two of Jupiter’s moons cross the planet’s face, followed by Io’s shadow and the Great Red Spot. Observers in western North America will see two of Jupiter’s moons cross the planet’s face, followed by Io’s shadow and the Great Red Spot at the end of March 2012. Mercury will be well placed as an evening “star” during the first half of March, being at greatest elongation east on March 5. This is the most favorable evening apparition of 2012. Venus is a brilliant object in the evening sky after sunset all month, and is at greatest elongation east on March 27. The waxing crescent Moon will pass close to Venus on Mon. March 26, making it an easy target in the daytime sky. Mars is in Leo all month, reaching its maximum size for this apparition of 14 arc seconds. By the end of the month it will already have faded from its maximum of magnitude –1.2 to magnitude –0.7. 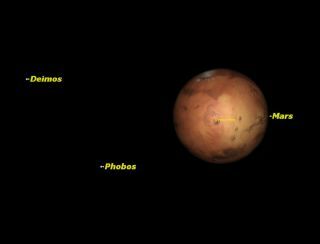 Mars rises around sunset and sets around sunrise. Jupiter continues to shine brightly in the western sky all month in Aries, setting around 11 p.m. Jupiter and Venus are the brightest objects in the evening sky other than the Moon. Saturn rises around 10 p.m., and is visible the rest of the night. It now shines brighter than nearby Spica. For most of the month of March, the four brightest planets, Venus, Mars, Jupiter, and Saturn, will all be above the horizon around 9 p.m.
Uranus is too close to the Sun to observe, being in conjunction with the Sun on March 24. Neptune is too close to the Sun to observe.